Jonathan McDaniel understands firsthand the scarcity of quality farmland, so he uses the AgriEdge Excelsior program to ensure his family’s farm is making the most of what is available. With the help of the AgriEdge Excelsior grower program, Jennifer James keeps her record-keeping simple and her farm demonstrably sustainable. When Jacob Kalina returned to his family farm after college, he wanted a way to keep the operation efficient and profitable. He decided on AgriEdge Excelsior. Jason Gillis wants to get the most out of each field he plants AgriEdge Excelsior® provides insights to help him strive for that goal. His family of four is the core of his farm and finding ways to increase his ROI each season means a better future for them. Ryan Patterson uses AgriEdge Excelsior to keep his family farm profitable and sustainable for generations to come. Second-generation farmer Mike Helle is quick to note just how important each of his family members' roles are on the farm. 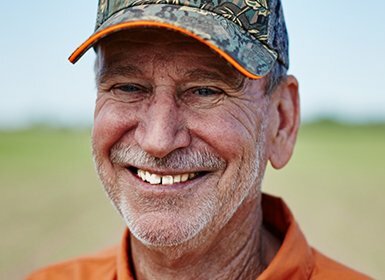 When Syngenta began offering the AgriEdge Excelsior® program to their growers, Jack Wallace was one of the first to sign up. Cody Carpenter had tried other software programs for managing his farm data, but after enrolling in AgriEdge Excelsior®, his productivity soared. He now spends less time inputting data and more time with his family and on the farm. Through the AgriEdge Excelsior® program, agronomist Shane Johnson found an opportunity to have in-depth conversations with his growers and to provide better service. Danny Parker first enrolled in the AgriEdge Excelsior® program because he wanted to improve the efficiency of his record keeping. With the Land.db® software, he is now able to quickly enter data and review up-to-date records. Andy Johnson began looking into the AgriEdge Excelsior® program because he wanted to improve his farm's financial record keeping. The Land.db software allows him to analyze his farm field by field. Steve Welsh is reaping the benefits of Land.db® and sustaining the family farm for the next generation. Realizing the strength of Syngenta products and benefiting from the cost share incentive, he has better yields and cleaner fields as an AgriEdge Excelsior® grower. Gary and Adam simplified the record-keeping at their retail location by using Land.db® to map every field they service and offering AgriEdge Excelsior® to growers to improve planning. To meet growing expectations, the AgriEdge Excelsior® program helps Kamren provide tangible evidence of his farm's sustainability. With the AgriEdge Excelsior® program by her side, Cathy helps the Boseman Farms flourish. Crystal DuBois-Taylor knows with the help of AgriEdge Excelsior®, her family is set up for success for years to come.